Our Pebble Dishcloths are like a collection of carefully gathered stones, beautifully textured, spirited, and very charming! A single-color block of garter stitch with an I-cord loop for hanging, making our Pebble Dishcloths couldn’t be simpler! Their complexity comes from our newest yarn, Lantern, a linen-wrapped white cotton core filled with immense character and surprise. It’s also wonderfully durable for the wiping, drying, and scrubbing work of a kitchen! 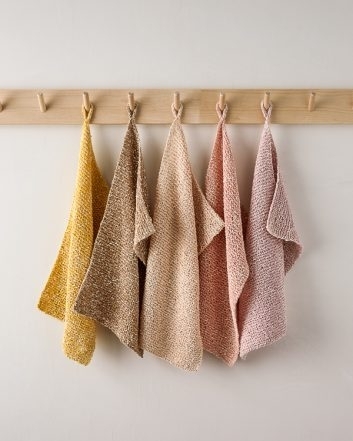 Make a set of your own beautiful Dishcloths with our Pebble Dishcloth Bundles. 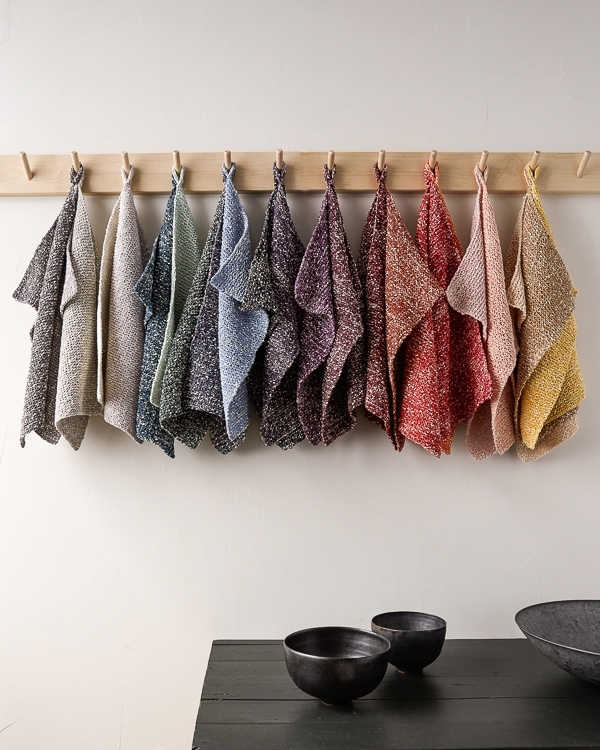 Available in 5 five-color palettes, each one explores its own corner of the spectrum, from delicate grays to syrupy purples. It’s amazing how a set of Pebble Dishcloths in Lantern illuminates the kitchen with sparks of color and beauty. Pack a Bundle on your summer travels and return with your own collection of hand knit treasures! 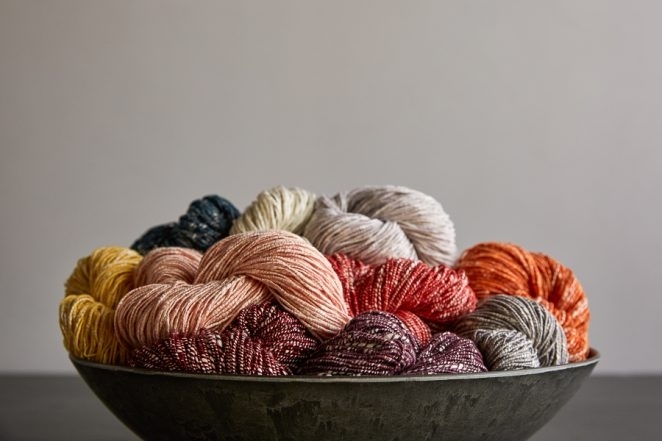 If you are using Purl Soho’s Lantern (or any other yarn whose color or texture is supposed to appear irregular and random when it’s knit), alternate skeins every one or two rows or rounds. 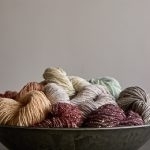 For tips on alternating skeins, check out our Working With Irregular + Hand Dyed Yarns: Avoiding Pooling tutorial here. Although our official recommended care instructions for Lantern are to hand wash and lay flat to dry, our insider practical knowledge is that Lantern holds up great in a cold or warm machine wash and even in a low or warm dry cycle. There may be a very small amount of shrinkage (like 2%), so stick with hand washing for garments. Also, washing with like colors is always a good idea! Row 1: Knit to end of row. Repeat Row 1 until piece measures 15 inches from cast-on edge. Bind off knitwise, until 3 stitches remain (1 stitch on the right needle and 2 stitches on the left needle), k2. Last Row: K1, k2tog, pass first stitch over second and off the right needle. Cut yarn, leaving a 12-inch tail, and pull it through the remaining stitch. Thread the tail onto a tapestry needle. Make a loop with the I-cord and weave the tail into the fabric of the Dishcloth at the base of the I-cord, then weave it through the looped I-cord, and back into the fabric of the Dishcloth. Weave in the cast-on end and your Dishtowel is ready to use! Thanks for writing in! Each dishcloth takes most of one skein of Lantern, so the bundle will make five dishcloths. You will also have enough leftover yarn to make a sixth striped dishcloth if you would like! Can these be machine washed? If so, do they shrink? Thanks for reaching out! Although our official recommended care instructions for Lantern are to hand wash and lay flat to dry, our insider practical knowledge is that Lantern holds up great in a cold or warm machine wash and even in a low or warm dry cycle. There may be a very small amount of shrinkage (about 2%) and washing with like colors is always a good idea! The recommended care instructions for this yarn is hand washing in cold… for dishcloths? I am OK with hand washing many things, but I think this is pushing it! Is there something I’m missing. 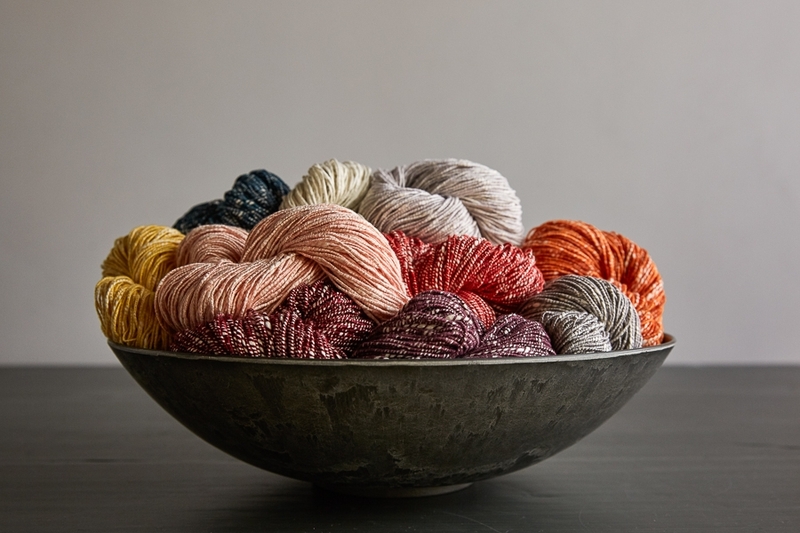 *Beautiful* yarn though, congratulations on another great addition to your line. Thanks so much for the kind words! Although our official recommended care instructions for Lantern are to hand wash and lay flat to dry, our insider practical knowledge is that Lantern holds up great in a cold or warm machine wash and even in a low or warm dry cycle. There may be a very small amount of shrinkage (like 2%) and washing with like colors is always a good idea! one more question…can you make up your own bundle of five colors? Thanks for writing in! 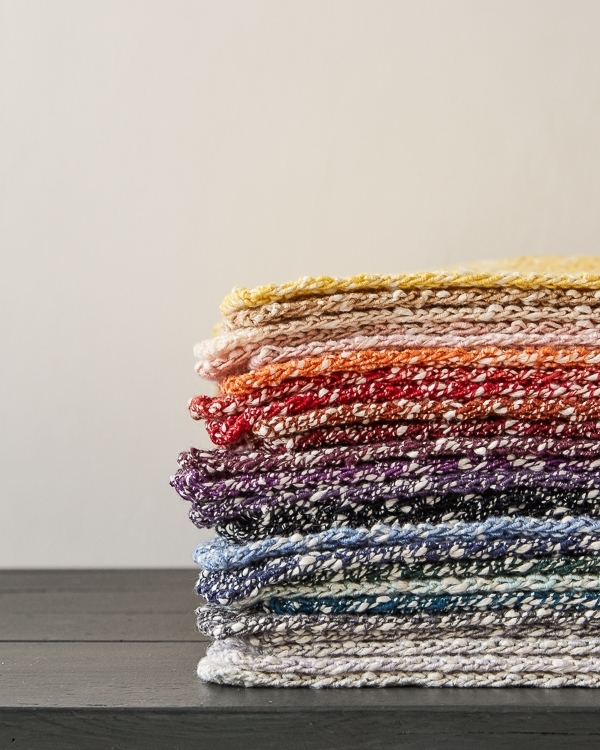 Although you are more than welcome to design your own color palette from the full range of Lantern, the discount only applies to our Pebble Dishcloth Bundles. 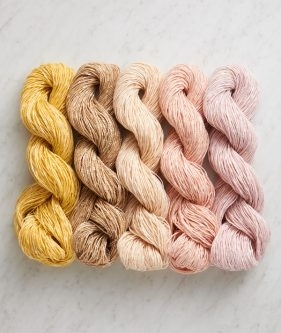 I don’t see any discount for purchasing the bundle which contains 5 skeins of yarn to $95. each which works out to be $19. per skein which is the individual price. Thanks for reaching out! Unfortunately our introductory price for the Pebble Dishcloth Bundles has already ended. 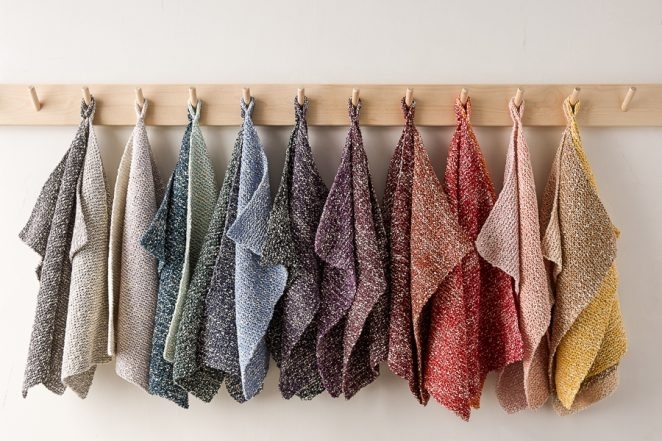 The best way to stay up to date on all of our new products, patterns, and promotions is to subscribe to our newsletter! 1. 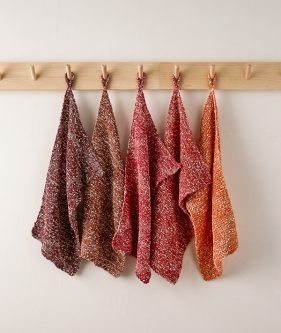 Approx what yardage is required for one of these dishcloths in case I were to use a different yarn with same gauge? 2. 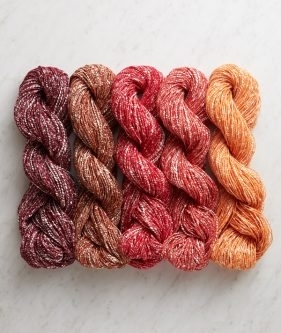 Are you suggesting I would need to buy TWO of the Lantern dishcloth bundles, since your “Note” specifically states I should alternate skeins every couple of rows in order to avoid pooling infusing Lantern? Thanks for writing in! We used about 150 yards for each washcloth, which is most of one skein of Lantern. When working on a one skein project, you either wind the skein into two balls and alternate with those, or if using a swift and ball winder, alternate between pulling from the center and outside of the ball. How many dishcloths can you make with one skein? Thanks for writing in! Each dishcloth uses most of one skein – although you will have some yarn leftover, it is not enough for another dishcloth. Another stunningly beautiful yarn! I firmly believe that we need to surround ourselves in beauty every day, with every item in our home. You make that possible purlsoho! Thank you! I am an 86 year old woman and am looking for a simple pattern for an afghan with cables. Not too many. I have 78 stitches cast on and would like to knit and purl a blanket with about 3 or 4 cables. I hope this gives you some inspiration! This yarn is beautiful! 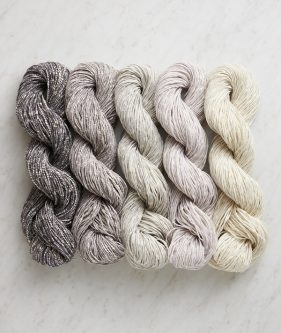 Can you recommend any sweater patterns (Purl Soho or otherwise) that this yarn would work well with? Lantern has a beautiful appearance, but only masochists would want to wear it next to the skin. It’s extremely coarse, which makes it perfect for dishcloths. Thank you for reaching out! This yarn is cotton wrapped with linen so the linen is a bit coarse to the touch. However I have found that, like any linen yarn, as I use and wash my yarn it softens up quite a bit. I hope you are enjoying knitting your dishcloths and happy knitting! These are Not free patterns. They are free with purchases. Thanks for reaching out! This pattern is free! No need to purchase the yarn. You can find the free pattern above and it is always accessible, along with hundred of other free patterns, on our site! No purchase is necessary. Thanks for writing in! We would be more than happy to wind your yarn for you! When you are completing your order, just leave us a note in the comment box and we will wind everything before we ship it. Good question! It is hard to say exactly without actually crocheting a sample, but since crochet uses about a third more yarn than knitting and we used most of a skein of Lantern for each knitted dish cloth, I think it would be best to plan on using a skein and a half for a similar sized crocheted dish cloth. I hope that helps! Let us know how your crocheted version turns out! 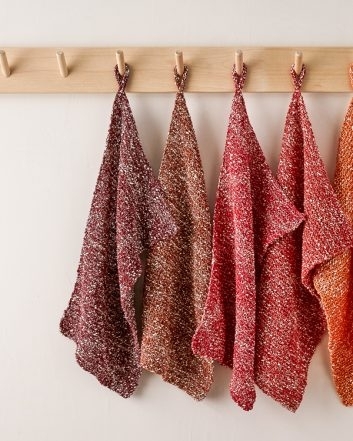 Do you have a shawl pattern you can recomend for one of the bundles? I don’t have much use for dish towels, but the colors are so lovely that I thought they would be nice in a simple garter stitch long shawl. Thanks for writing in! 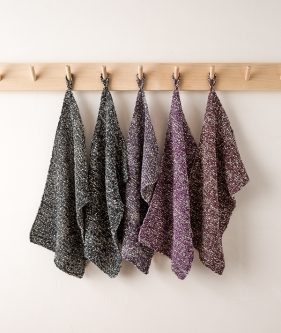 Although we don’t have a garter stitch shawl pattern, I think Lantern would create a very unique and interesting version of our Linen Stitch Colorblock Wrap! 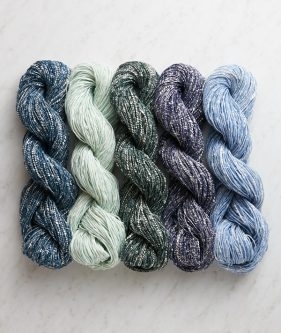 It would take 9 skeins which is more than one bundle, but you could create a really lovely palette or gradient from the full line of Lantern or by combining two bundles that coordinate, such as Oyster Shell and Coast. 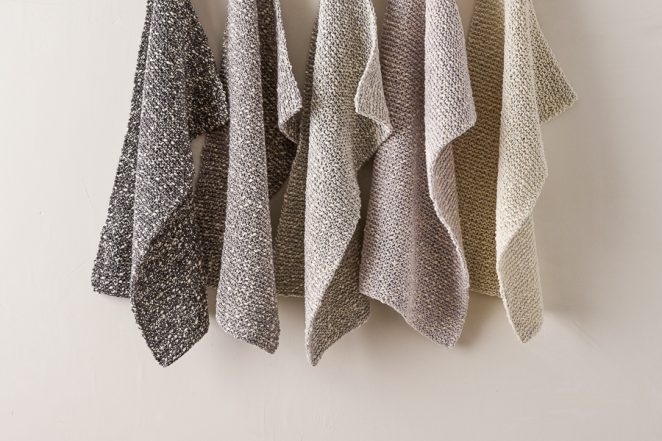 If you would prefer a simpler garter stitch color blocked wrap, I would suggest knitting a gauge swatch on US 8 or 9 needles or whatever size creates a fabric with a nice drape and hand, and multiplying your stitches per inch by your desired wrap width to find a cast on number. One bundle may not be quite enough for a good sized wrap so you may want to supplement with a few skeins of coordinating colors! I enjoy knitting dishcloths but have found the readily available cotton yarn in mass market craft stores is not very absorbent when used to wipe up water on counters. Is this yarn readily absorbent? Thank you for reaching out! I to enjoy knitting dishcloths and I have found this yarn to be quite absorbent when I have used my dishcloth. Good morning, does free shipping over $100 apply to Canada as well? Hello and thanks for writing in! Unfortunately our free shipping offer applies only to addresses within the United States. You can review our Shipping policy for full details on international shipments! I’m currently knitting dischloths with a cotton yarn with a cord wrap – not Lantern but a similar thing – and GOODNESS it is hard on the hands! Hopefully this yarn is different, but if anyone suffers from hand strain, just be aware and maybe try to consciously loosen your tension if you know you knit tight! Thanks for reaching out! Many knitters find knitting with cotton and linen can cause hand strain, but your tip to relax and loosen up will certainly help! I find that taking frequent breaks can also prevent pain when working with less elastic fibers, but the results are well worth the extra effort! 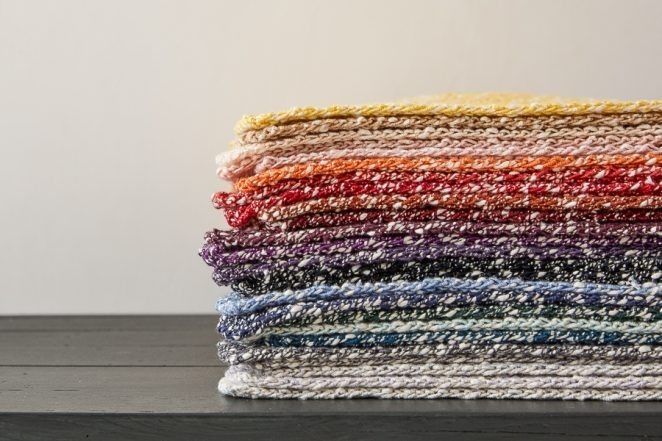 Can this Bundle be used for the slip stitch dish cloth pattern? 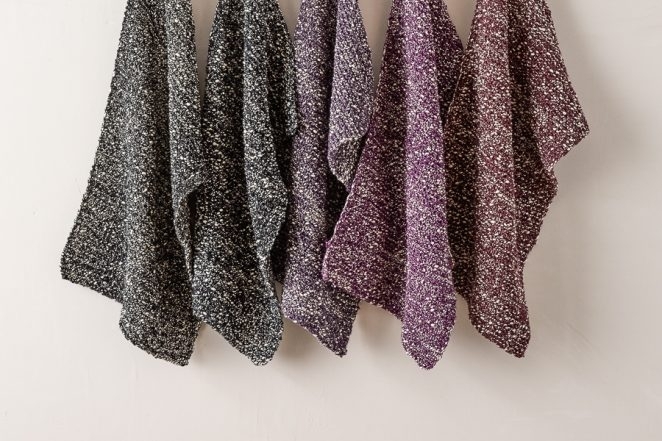 I love the pattern and wanted to order the yarn that is used for it but those yarns are not available so I was wondering if these would work and if so will the dish towels be soft enough and absorbent using this yarn? Thanks for reaching out! I think Lantern would be beautiful for the Slip Stitch Dishtowels, but since Lantern is a bit heavier weight than Cotton Pure, you will have to make a few adjustments to the pattern. I would suggest knitting a gauge swatch in Lantern in stockinette stitch using US 5 needles, and once you have measured your stitches per inch, you can multiply that by 11.25 (the width of our Slip Stitch Dishtowels) and round to the nearest multiple of of 4 plus 3 for the Three-and-One Tweed and the Basket Stitch patterns, or a multiple of 3 plus 1 for the Triple L Tweed. This pattern is both wider and longer than our Pebble Dish Cloths, so I would plan on having one skein of each color for each dish towel. Thank you for reaching out! I agree, this yarn will make and adorable baby bib, be sure to let us know how it goes! Thank you for writing us and for your interest in this pattern! This dish cloth is very durable, but would not be a replacement for a sponge for heavy duty scrubbing. It is not strictly for drying or washing and can be used for many kitchen chores including washing and drying. Just received my skeins and they are just unbelievably gorgeous. The tones are so rich and deep. 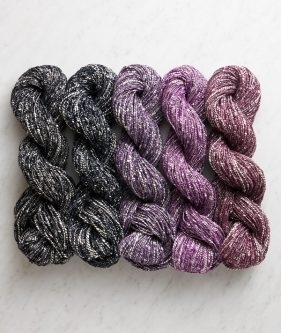 I missed reading the in-depth detail about pooling, so instead of trying to split my skeins by hand, I ordered 1 more of each color. These will be gifts for someone and now I can make four! I love the colors and the texture as far as looks, but my concern is how it feels. I started the dishcloth and the texture is very rough and does not feel like it will absorb. Will this soften up with use? Thanks for writing in! 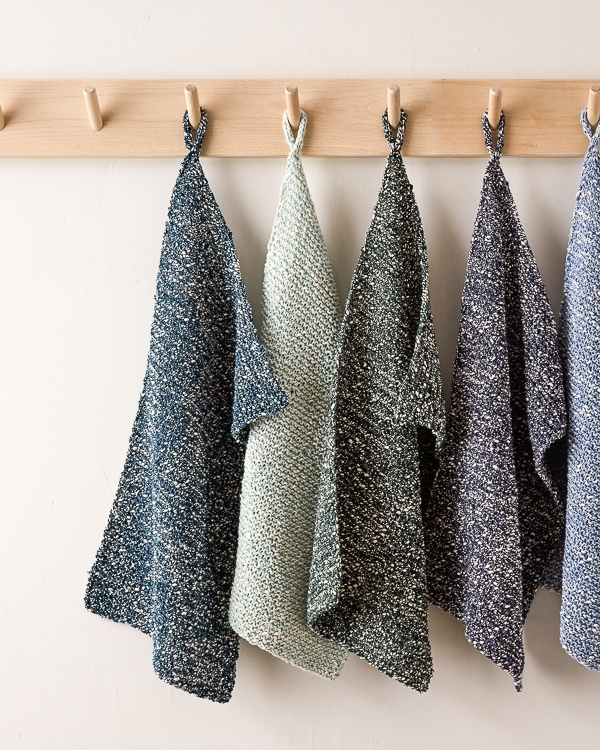 As with all linen yarns and fabrics, Lantern does get much softer with wear and use! A trip through the washer and dryer will go a long way towards this – although our official recommended care instructions for Lantern are to hand wash and lay flat to dry, our insider practical knowledge is that Lantern holds up great in a cold or warm machine wash and even in a low or warm dry cycle. There may be a very small amount of shrinkage (like 2%) and washing with like colors is always a good idea! 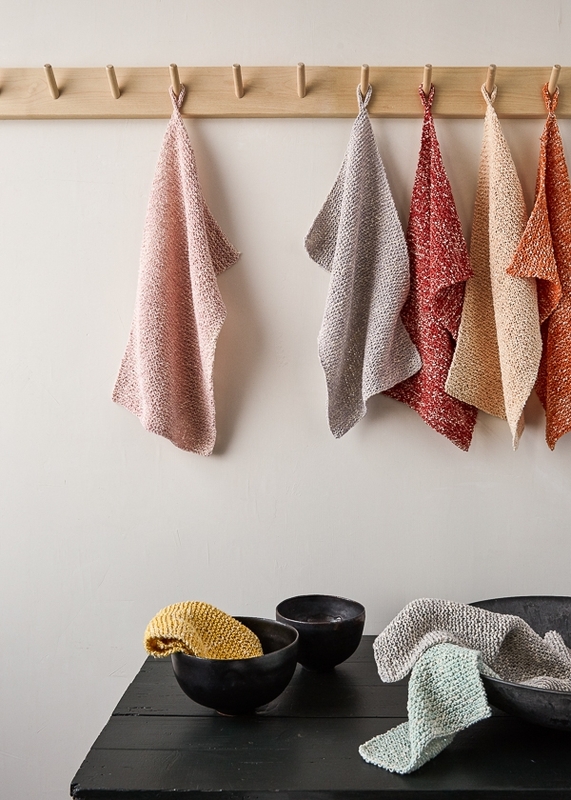 The Pebble Dishcloths look beautiful. However, is there anyway to create this as a crochet pattern? I don’t knit, but love to crochet. The dishcloths would make a great bridal shower gift for my niece. Thanks. Thanks for writing in! Although we don’t have a crocheted version, I think you could make a very similar dishcloth using half double crochets! To figure out your starting chain, you will want to crochet a gauge swatch with an F or G hook in half double crochets . Once you know how many stitches you are getting per inch, you can multiply that number by the width that you would like and chain that number plus two for a turning chain. Since crochet uses about a third more yarn than knitting and we used most of a skein of Lantern for each knitted dish cloth, I think it would be best to plan on using a skein and a half for a similar sized crocheted dish cloth. I love the dishcloth bundle and am enjoying knitting it up. However, I have a question about gauge. To get gauge I am using a size 1 needle! I’m so interested to learn if other people had to go down in needle size to get close to this gauge. It seems extreme. But with size 5 the cloths are very loose. Thank you for reaching out! This is a big difference, especially if you are not usually a loose knitter. My first thought is that due to this yarn’s unusual texture i think it is prone to a looser knit. The type of needle can change your gauge as well, for example from metal to bamboo. All this being said, If you are getting gauge on a 1 needle I wouldn’t worry to much. Gauge varies greatly from knitter to knitter. I think Lantern is a beautiful yarn. 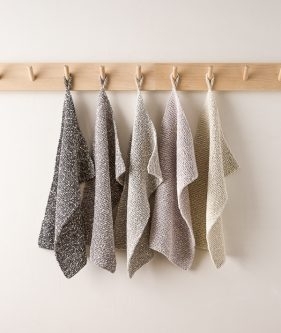 I am wondering if it is a good choice for placemats-perhaps in garter or linen stitch. If so, could you recommend how much yarn would be needed for a 13×19 size placemat? Also, what needle size would you suggest? Thank you for reaching out! I think this is a fantastic idea. I would estimate that this will take two skeins. Depending on how dense you would like your fabric to be I would use a US 4 needle. Was wondering if you can just bind off if you don’t want the cord loop on it, then you would only need the US 5 circular/straight needles. Thanks for writing in! You are correct, if you wish to omit the hanging loop, you will not need the double pointed needles! I made 5 washcloths out of one skein of Lantern. My hands are small so I made them small. I love their looks. But, the darn things don’t absorb water. They are fine washing things by hand but don’t even try to wash off your counters or stovetop. They leave a trail of water, rather than picking it up, no matter how hard I wring them out beforehand. Very disappointed that have 4 more skeins of the stuff that I don’t know what to do with. 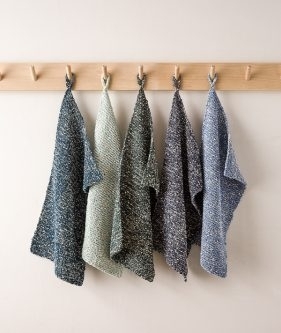 On the other and, the towels I knit with Field Linen are fabulous. My husband say they are the best kitchen towels we’ve ever had. That’s 48 years worth of towels so that really says something. Thank you for at least some success in my knitting. I’m so sorry to hear you aren’t completely happy with Lantern! Have you tried running your washcloths through the washer and dryer to see if they improve? 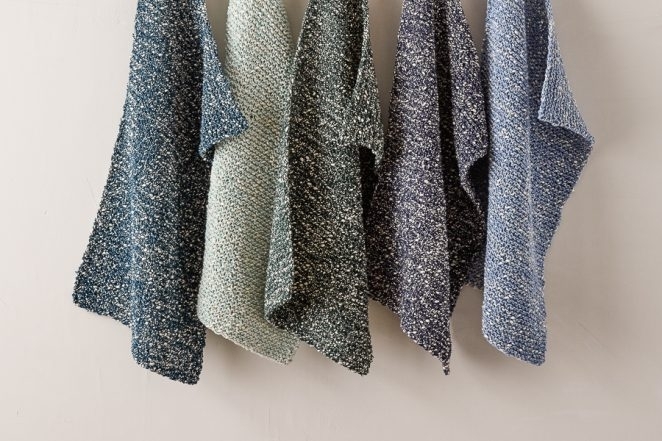 Linen does often take a few washes to break in and reach peak softness and absorption, so I would try that before giving up on your other skeins. If all else fails, you can return any unwound yarn for store credit. Thank you for your response. I’ll keep washing them and see what happens. I have a friend that finds the lantern yarn is a bit heavy for her hands when using this washcloth. She has a problem with arthritis. Can you suggest a lighter yarn to use without compromising the basic and simple pattern? I crochet so the washcloths were done in single crochet. They all came out beautifully. Thank you for reaching out- I’m so happy to hear your dishcloths came out beautifully! 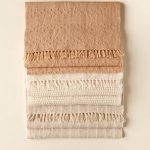 I would reccomend checking out our Field Linen for a lighter weight option or Habu’s Cork Chenille.